'God help us!' A pair of California wildfires rage out of control as the perfect storm hits So Cal and Nor Cal at the same time. A fast-growing wildfire forced tens of thousands of residents from their homes in northern California on Thursday. 'God help us!' 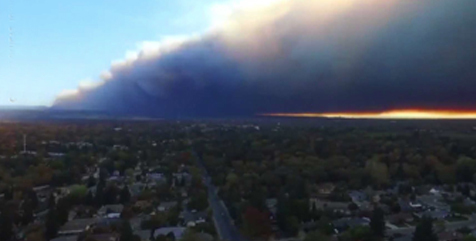 A pair of California wildfires are rage out of control as the perfect storm hits So Cal and Nor Cal at the same time. Large fires threaten Ventura County communities; 101 Freeway closed, more than 1,000 homes evacuated. Portions of Ventura County were under siege Thursday afternoon as two large fires descended on neighborhoods, threatening numerous communities reeling from the massacre at a country music bar the night before. The Hill fire was being whipped up by powerful winds that pushed it through canyons and to the edge of Camarillo Springs and Cal State Channel Islands, both of which were evacuated. Ventura County officials estimated 1,200 homes were evacuated in the Camarillo Springs and Dos Vientos areas. Live television footage showed at least one home and several RVs consumed by flames.